Next to an in-person meeting, video is the most persuasive communications medium. Video communication takes advantage of a person’s inherent ability to visually discern what others are saying based on body language and facial expressions. A video call restores the immediate clarity and feedback lost to years of audio-only telephone usage. 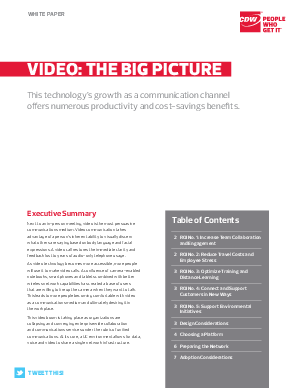 This white paper provides a practical guide to understanding and defining video communications needs, selecting the appropriate architecture, preparing the network and driving adoption.